Venice’s Jewish cemetery is reachable only by boat. It is located on the island of Lido, just to the east of the lagoon city. In fact, it’s been Venice’s place of Jewish burial since the 14th century, even before the founding of the Ghetto. The cemetery fascinatingly reflects the unique religious cultural mix of the Venetian ghetto itself: Ashkenazic, Italian and Sephardic (Ponentine and Levantine, Western and Eastern). 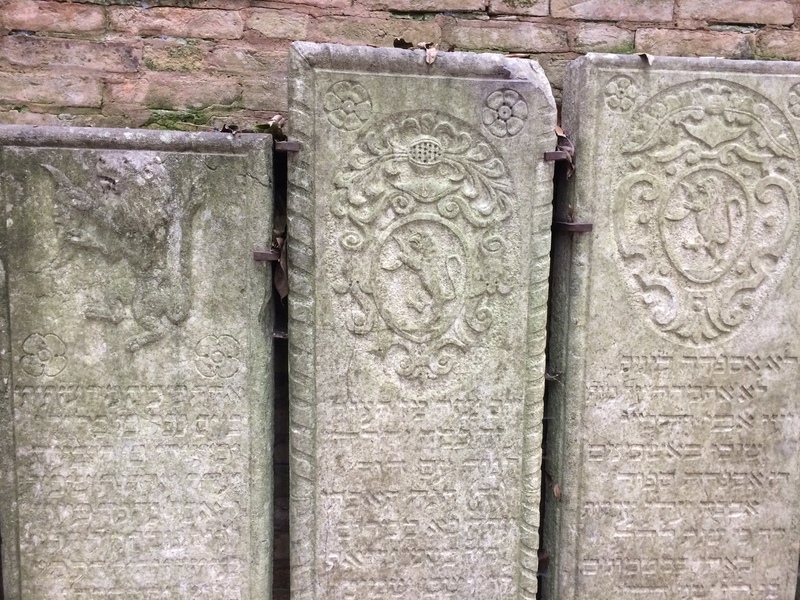 Ashkenazi and Sephardi tombstones (standing and lying flat respectively) are interspersed throughout. I visited the cemetery with Aldo Izzo, who has devoted years of his life to its restoration and preservation. In 1774 a second cemetery was opened a bit further inland and the old cemetery was left largely neglected. It further deteriorated as the Venetian army used it as a staging ground for the defence of the city against the Ottomans. They moved its stones to make space, and they were not always put back into their original places. Over time, cemetery land was slowly expropriated, with stones from repurposed areas tossed into the remaining section. Other parts of the cemetery sunk into swampland. The cemetery now only covers one-fifth of the original five-acre plot. Thanks to Aldo, in recent decades the remaining area has been cleared of overgrowth, the water has been drained, and the stones have been placed in greater order. The work has saved the cemetery from being lost forever. However, the result of all of centuries of upheaval is that the current state of the cemetery, as organised as it now is, does not reflect its original composition. Many stones also simply line the outer walls of the cemetery, and they are not in any particular date order. It is therefore difficult to draw too many conclusions from the cemetery. Still, there were a couple of features that stood out to me. For one, there weren’t any stones written in Portuguese as is the case throughout the rest of the Western Sephardic world. 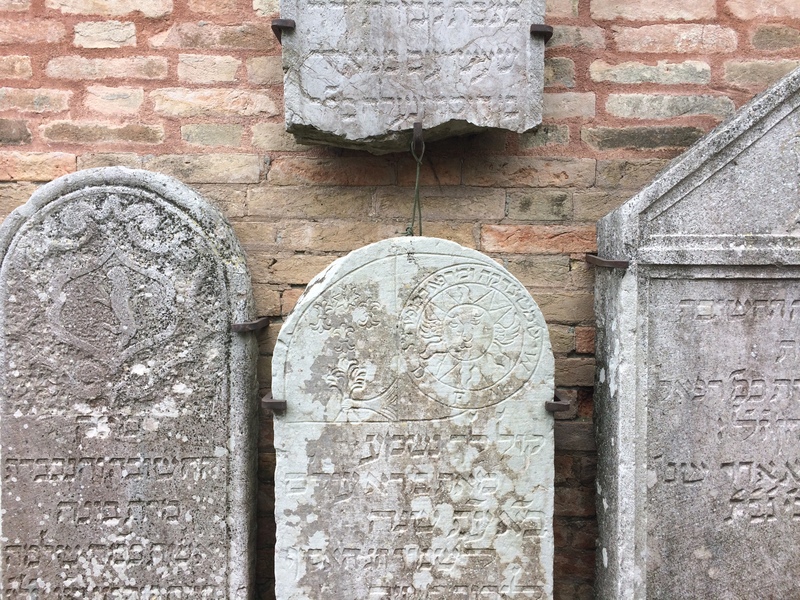 This may reflect that the Portuguese who arrived in Venice, despite their establishing an independent congregation (the Ponentine ‘Spanish’ synagogue), more readily accepted ‘local’ Jewish burial norms, using mostly Hebrew. In other places in the West, the Portuguese Jews were the first Jews to arrive, and so they established their own stone style. The Sephardic stones in Lido, however, like in the West, do contain certain types of images and symbols which are uncommon on Ashkenazi stones. Some images reflect the names of the deceased or are family crests, whilst others are more kabbalistic in nature. Ironically, one of the more historic remaining stones (without images) is that of the important rabbi Leon de Modena (d. 1648) who was decidedly anti-kabbalah. 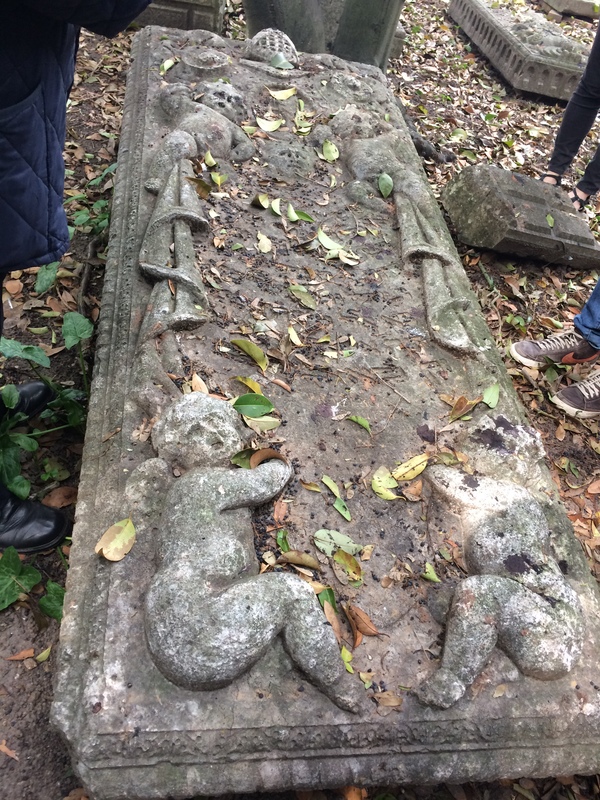 A walk through the new cemetery revealed the changing nature and tastes of Venetian burials. The new cemetery includes a certain degree of innovation, such as crypts, monuments and images of the deceased. Still, the burial place as a whole reflects the continuity and unity of the community throughout the centuries. Despite the ups and downs of Venice, the disruption and destruction of the holocaust, and the area’s population decline, the community continues, and it remains alive until this day.